The Truth Will Set You Free If You Can Get It | "Northern Crossings"
Give them time and they do tell you what they mean. Some one on the talking heads show admitted that they are willing to ruin the lives and reputations of people and make up stories and not tell the truth about the stories they do have and they admitted mistakes that they had made were in their haste to get rid of President Trump. 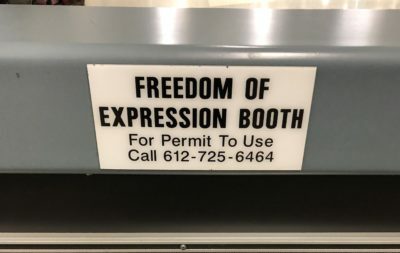 And then there is this – truth stated in the form of a sign – you have the right to express yourself. It’s called freedom of speech. You just have to get someone to give you permission. It would be interesting to know who the permitting party is and what it might cost? Notes on Preaching 4…… Running the Race Again.